Compare two folders (files and sub-folders) and see what files are the same and what files are different. Display the folder comparison side-by-side. Reconcile the files manually, or use one of the five automatic reconciliation methods: Synchronization, Backup, Mirroring, Replication or Consolidation. ViceVersa PRO works with folders on any media: Hard-disks, USB disks, NAS, Flash drives, DVD-RW, CD-RW, etc. ViceVersa PRO works across computers over the Network, LAN, VPN. No limit on data size or file size. ViceVersa PRO can easily handle terabytes of data. 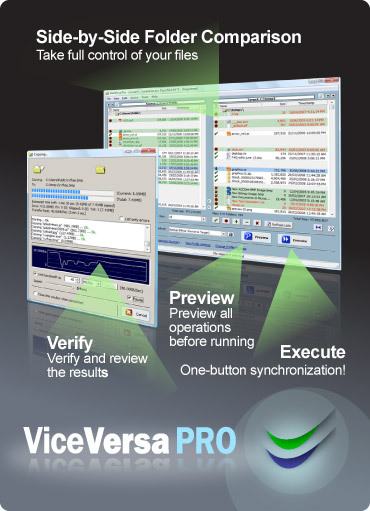 Try ViceVersa PRO completely free for 30 days. Simply download the installer and run!